Excerpted from Pulitzer Prize winning author Anna Quindlen's commencement address to Villanova University, Friday 23 June 2000. Seed questions for reflection: What does getting a life mean to you? Can you share a personal experience of a time that you noticed the grandness of life all around you? 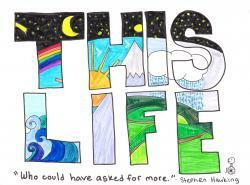 What has helped you to "get a life" that is grand, generous and shared? All that is is one and is sacred, and that includes each of us. To me getting a life means to realize that and live accordingly. It means seeing others and every being, animate and inanimate, as an expression of the one and sacred, just as I am. It means to be grateful for my living. It means to take the time to appreciate and enjoy all of nature and all that is. It means to not be controlled by making a living or pursuing other ambitions in such a way that I lose my life. I don't know of a specific time when I noticed the grandness of life. I know I noticed it today, which was a glorious day here where I live. Awareness of the grandness of life that I am part of and that is all around me developed as a result of my becoming aware that all that is is one and sacred, and that awareness changed me and is enhancing my developing a life that is grand, generous and shared.